Personalised name signs for every occasion. 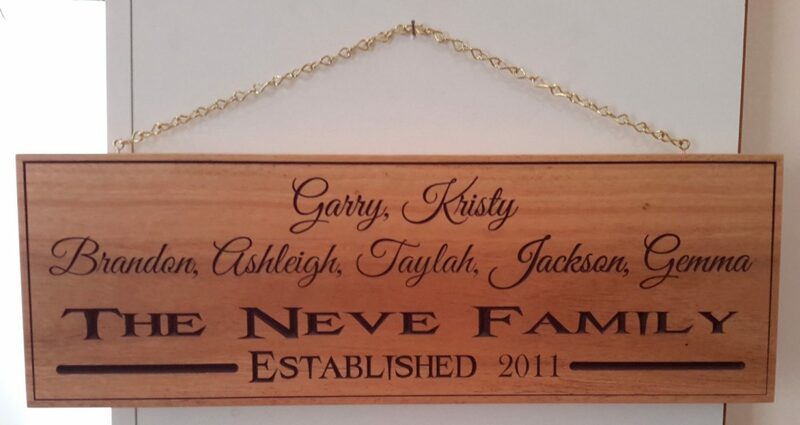 Hourigan Designs is the premier Australian workshop for personalised wooden signs. 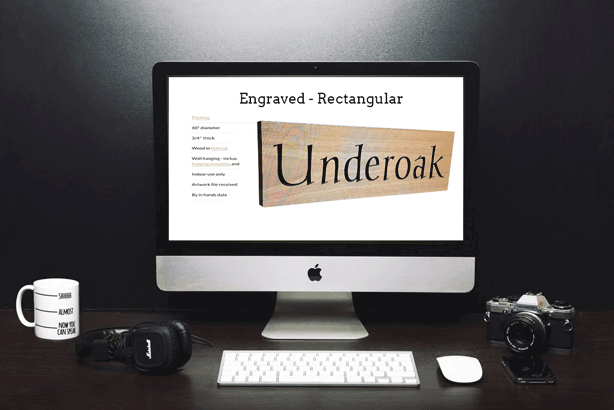 Whatever type of wooden name sign you need, we have a solution that fits the bill. You might be looking for a unique present idea for a friend or family member, or perhaps you’re after something for yourself. Whatever your reason for requiring wooden name plaques or signs, you’ve come to the right place here at Hourigan Designs. The one and only focus for us is to provide our customers with custom-designed and crafted products, and with the huge amount of care we take in crafting each and every item we’re commissioned to complete, you’re sure to absolutely love the results. The passion that we put into each project is clearly seen, which is why our customers keep coming back. We offer completely custom engraving so whatever message your sign needs to communicate, you can do it not only with your personalised message, but with a huge range of fonts, engraving styles, images, several other options for you to really give it your own personal touch. Each design is unique and makes for a fantastic personalised gift. We have designed and delivered hundreds of signs across Australia and no two have been the same. However, one thing all our signs have in common, is that all who have received them have been delighted with the results. You’re able to fully customise what you receive – from the size and shape of the sign itself through to fonts and colour, and even the type of timber you’d prefer, we’re here to deliver something that’s totally unique. 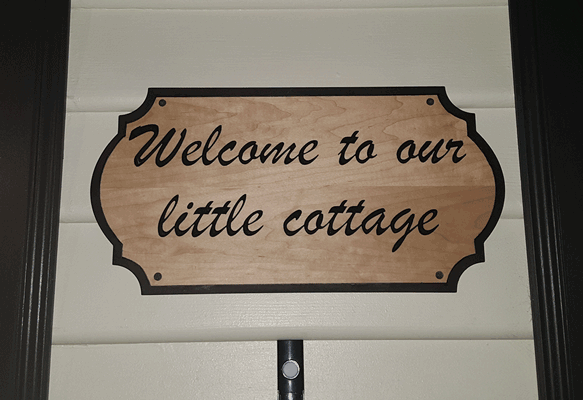 Further to name plaques we have other products in our range for you to choose from including wooden personalised signs for weddings and a whole lot more. Be sure to take a look through our entire selection of products and if you have any questions, get in touch with us today. Wherever you are around Australia, we will gladly ship right to your front door. If there’s anything that remains unclear in regards to one or more products we have available, please don’t hesitate to call us directly on 0428 497 041 to chat with us directly. If you’d prefer, you’re welcome to send us an online message and we’ll respond to you ASAP. 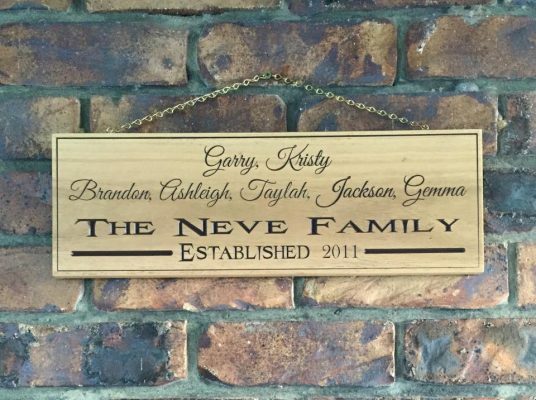 Over the years we have crafted hundreds of personalised name signs for families across Australia. Often these signs mark very special events and occasions in their lives – births, marriages, new houses and homes, new holiday properties and more. It is a great pleasure for us to be involved in these special times and we craft each and every sign with care and attention to detail so that you are proud of the end product. Name Signs are a broad and varied category in the signage world. Your family has a name, and so do your family members and pets. But people also like to name their houses, man caves, sheds, rooms and other spaces to give it that personal touch. Whatever type of name sign you need, we have you have plenty of options to make sure your personalised name sign is just right. Below are some of the most commonly requested name signs, but if it is not shown below, please let us know as we can probably still help. Decorating a newborn’s room is a big task. If it is your child, a wooden baby name sign, to adorn the wall or door is the perfect topping on the cake. As a gift, it will no doubt be one of those gifts that stands out from the crowd of toys, clothes and other baby goods that will be lucky to last a few months. Children love the idea of having a space that is just theirs. A personalised wooden door name sign is a great gift that kids will love, because it gives them a feeling of ownership. 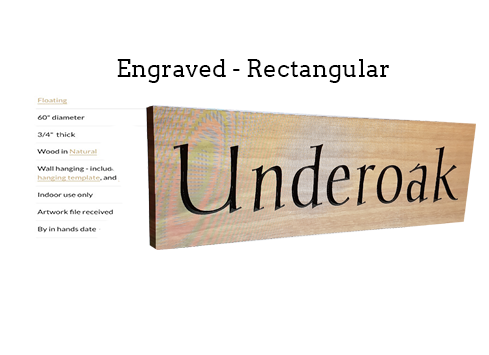 We can either engrave their name into a wooden sign or cut the individual letters for a bold effect. What better way to commemorate the establishment of a new family than a personalised family name sign. We can include the family name, a family crest (if you have one! ), the establishment date and the names of family members. If your family is growing, we can always engrave more names down the track. There is no doubt that pets are an important part of modern families. They are always there and bring lots of love and happiness day in and day out. Pet name signs are a great way to celebrate their importance. 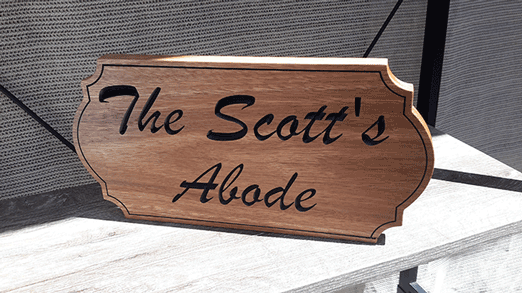 Whether you are looking for a dog name plaque or sign for your outdoor doghouse or a even a pet memorial plaque we can create a personalised plaque or sign just for your special furry friend. 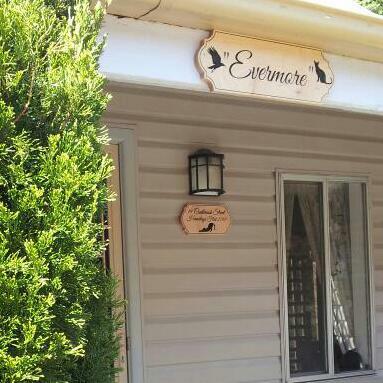 Nurseries can be a magical place and our signs add charm, character and a personal touch to the space. We can create signs with popular nursery rhymes, wooden letters that can be mounted on the walls or to decorate shelf or table space. In addition, we can cut wooden shapes and characters – the limit is your imagination! Owning your own cottage or cabin is fantastic way to get away from the speed and stress of normal life. There is nothing quite like pulling up the car outside your home-away-from-home and reading a wooden name or sign with the name you having given the property. Once you read that sign, you can (and the whole family) know you can all relax.